We are blessed to have the most wonderful staff at Lord's Landscaping. We have a diverse group of specialists that can help you with any of your landscaping needs. We can't wait for you to meet our family! 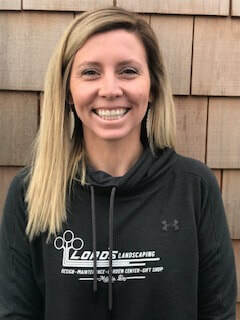 Amy Hughes is the proud new owner of Lord's Landscaping, having taken the reigns from her father, Bill Lord, and mother, Donna Lord. Amy graduated from the University of Delaware in 2008 with a degree in Education and a master's degree in Technology. After teaching high school math for 7 years, she joined the Lord's Landscaping team to support her family's business and to spend more time with her two girls. As owner, Amy focuses on daily operations as well as technology and advertising in the Garden Center. Her enthusiasm and organization have generated fresh ideas on how to improve an already thriving business. ​Pat Hughes is the Maintenance Supervisor at Lord's Landscaping, as well as the new co-owner of the business. Pat is smart, efficient and organized. He earned an engineering degree from the University of Delaware and has a strong construction background after working for years with Jamie Allison Construction in Fenwick Island. Pat pays attention to every small detail to make sure each job is done correctly and is very responsive to each customer's requests. Please contact him anytime to set up a personalized yearly maintenance plan for your home or even a one time trim and cleanup. 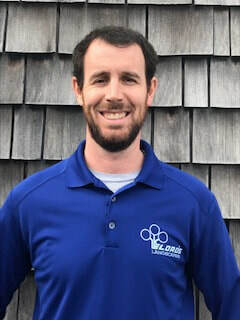 Cody Kuhnert has managed our Design and Installation Department at Lord's Landscaping for over 16 years and is one of the hardest working, loyal people you will meet. His experience and knowledge of our area have helped him become an amazing Landscape Designer. Let Cody create your beautiful landscape at the beach. He calls back right away, will take the time to learn your ideas, and can create a drawing that will knock your socks off! His work ethic and attention to detail make his jobs stand out as the best in the business! AJ is our Garden Center Manager. He started working at Lord's Landscaping over 12 years ago and has been in the landscaping business his whole life. He does a lot of behind the scenes work that allows Lord's Landscaping to run smoothly. AJ can answer your plant identification or disease questions and can help you find anything in the Garden Center. His work ethic and love for landscaping are unique gifts that make him an indispensable asset to our company. Geraldina Cruz has kept Lord's Landscaping a happy place to be for over 15 years. Dina will greet you with a smile and can help you find anything you need around our 4 acre garden center. She is very knowledgeable and is our go-to girl for help with any aspect of the business. She can ride a fork lift, load bags of mulch and carry pottery. She is not afraid to get dirty and always has a smile on her face. She makes Lord's Landscaping feel like home, and she would love to meet you and help you with any of your landscaping needs. ​Sam runs the retail shop at Lord's Landscaping. He moved here last year from Baltimore, loves the Ravens, and loves to talk football! You will probably find him behind the counter inside the building ready to help you with all of your fertilizer, chemical and retail questions. Sam is the hardest worker you will ever meet and would be happy to assist you in any way. We are so grateful to have such a wonderful person as the face of our business. Lindsey Thompson is your go-to girl for all things tree and shrub. She has an extensive knowledge of plants and continues to grow professionally each day. Lindsey currently works part time so she can stay home with her beautiful children. Although being a Mom is her favorite thing, she enjoys loading, lifting and digging while she is with us and would never let one of the guys show her up. Lindsey can lead you through our 16 beds of trees and shrubs and share with you her passion for plants and all things outdoors and maybe a little about her kids too! Miya is our Inventory Specialist at Lord's Landscaping. She is technologically savvy and organized, and she can help you find anything in the garden center. Miya is currently student teaching, but you can still see her smiling face every weekend! She is friendly and engaging - truly a welcome addition to the Lord's Landscaping family. Kelly is our new Nursery Manager at the Ponderosa (our growing facility). She is organized and diligent - a winning combination for healthy, beautiful plants. Kelly keeps our garden center well-stocked with the right plants at the right time. You can be sure that the plants at our garden center are ready to perform in your landscape! Bill Lord and his wife Donna owned Lord's Landscaping from 1978 to December 2018. They are proud to turn over the business to their daughter, Amy, and son-in-law, Pat, and they are excited to see the positive changes Pat and Amy make! Bill's work ethic, loyalty and plant knowledge led him to create one of the most well respected landscaping companies in Delaware. Bill remains available for limited designing and consultation.